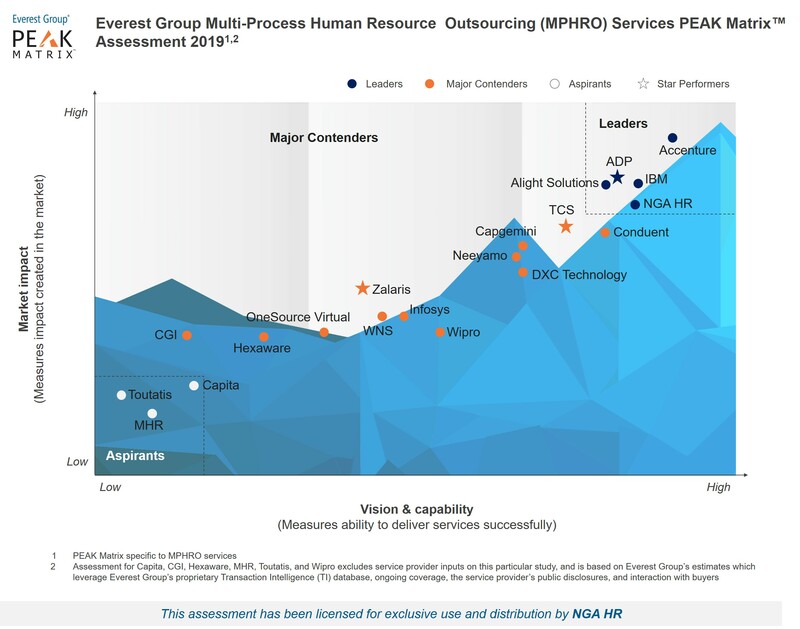 29 January 2019 – Hemel Hempstead, UK: NGA Human Resources has maintained its ‘Leader’ position in the Everest Group’s Multi-Process Human Resources Outsourcing (MPHRO) – Service Provider Landscape with Services PEAK Matrix™ Assessment 2019. This annual review of 20+ MPHRO service providers gives HR professionals an independent, objective, data-driven and comparative appraisal of key players based on their actual market success, vision and delivery capability. NGA HR is highlighted in the PEAK Matrix for its expertise in HR, its global coverage, and its ability to serve enterprises of all sizes. Client feedback in the report draws attention to the capability of NGA HR service’s teams to implement quickly and to offer a ‘one-stop-shop’ for consulting, implementation, and end-to-end HR services. “NGA HR’s suite of implementation and hire-to-retire HR services solutions makes it a prominent player for enterprises seeking to enable HR transformation. Its focus on employee experience-driven HR services along with investments in enhancing technical and domain expertise have resonated well with clients and will likely stand it in good stead in the fast-changing HR services market,” explained Anil Vijayan, Practice Director, Everest Group. Many of these services are delivered in partnership with leading HR and workforce management technology vendors. The strength of these partnerships and the service agility this strategy for combining best technologies with best skills enables, is also recognized in the MPHRO PEAK Matrix. 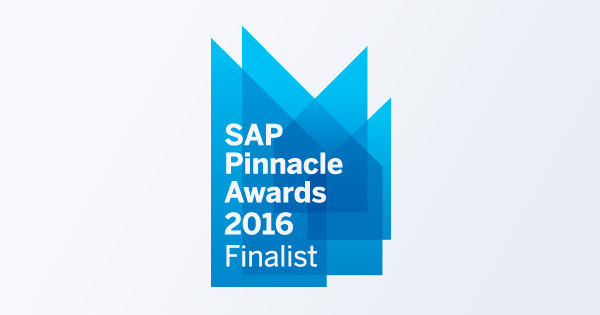 The partners mentioned are SAP SuccessFactors, Workday, Kronos, PeopleDoc and Nakisa. Three significant HR and MPHRO client wins are mentioned in the report. These are the multi-country delivery of HR and payroll services for a large global electronics manufacturer; HR services for a multinational bank requiring support in 22 countries, and for the third, HR administration and global payroll for 48,000 people across 14 countries for a European restaurant operator. Investment in ongoing innovation, including the addition of ‘NGA Analytics’ to NGA HR’s advanced HR analytics offering and the integration of Robotic Process Automation (RPA) and Artificial Intelligence (AI) solutions into its HR and payroll services, are also pulled out as key differentiators for NGA HR in the service provider landscape. “We’re proud to once again be recognized as a leader for MPHRO by Everest Group. Much of the reference to us in the report highlights our commitment to service delivery and continued innovation in the HR services we deliver locally and globally. We’re also highlighted for the agility our partner strategy brings to our client services and we thank the partners and clients who gave such positive feedback about us,” said Anita Lettink, SVP Strategy & Alliances at NGA Human Resources. 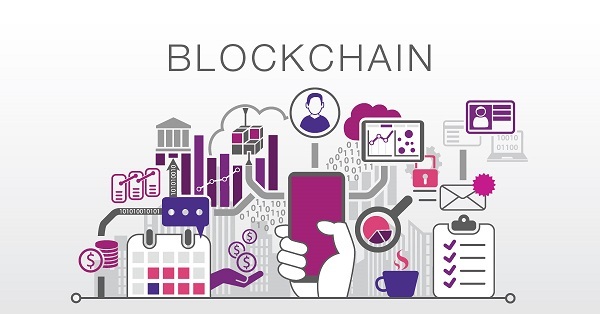 “Continuing our innovation investment, earlier this month we announced an exciting blockchain partnership with Gospel Technology, one that potentially sees the integration of distributed ledger technology into our services. This is potentially game changing for the security of PII data in HR and payroll services and NGA HR is very excited to be pioneering this,” continued Anita Lettink. Additional NGA HR Everest Group PEAK Matrix recognitions can be seen here. This report examines the dynamics of the Multi-Process Human Resources Outsourcing (MPHRO) service provider landscape. It provides a deep-dive analysis of how the service providers shape up in terms of their market impact and vision & capability. Based on the comprehensive Everest Group PEAK Matrix, 20 MPHRO service providers are segmented into Leaders, Major Contenders, and Aspirants.